The C2-PLL ® Phase Lock Loop C-band series of two output LNBF technology provides exceptional reception of weak satellite signals and the most demanding high FEC S2 channels. The wideband version, the C2-PLL Wideband model covers the entire 3.4 to 4.2GHz C-band range. Designed to meet the requirements for light commercial applications and the most demanding satellite hobbyist, it is cost-effective, high quality and professional grade. The Titanium Satellite C2PLL quality and hardware is unsurpassed! 3GHz rated f-fittings pass the entire frequency range with minimal loss. Independent voltage switched outputs for receiving both horizontal / vertical linear polarities (or right / left circular with the included dielectric slab). The C2PLL kit includes a flat scalar with zinc screws and a hex tool. 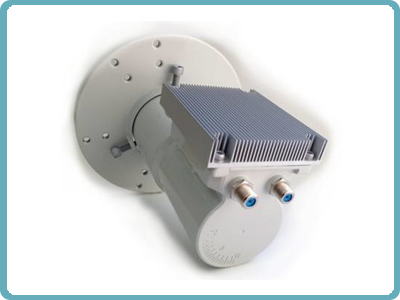 The flat scalar is designed for prime focus dish types and fits the industry standard 68mm scalar mounts. Be sure to check out our optional Titanium CS1 conical scalar for operation of the C2PLL on offset type dishes. The heavy aluminum casting, white poly coating and cooling fins assist with keeping the C2PLL operational temperature low and running cool. These thermal control features increase the C2-PLL performance and stability, insuring many years of reliable service. Titanium Satellite provides a Lifetime Warranty on the C2-PLL against frequency drift! If you are not completely satisfied with the performance of the Titanium C2PLL series of LNBFs, we will promptly refund your purchase!